Ebook Glue is a neat service that I discovered on Lifehacker this evening. 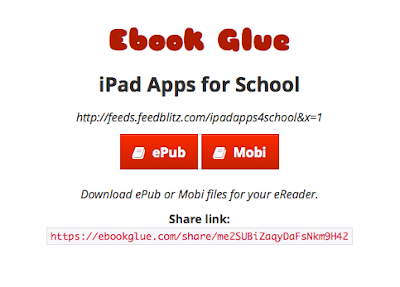 Ebook Glue allows you to create an ebook from your blog posts. To use the service just enter your blog's RSS Feed or your blog's URL if you don't know the address of your feed and Ebook Glue will turn your posts into an ePub and Mobi files for you to download, read, and distribute. I gave Ebook Glue a try with my new iPad Apps for School blog's feed and it did exactly what it advertises. I was able to type in my blog's URL, select ePub, and then download an ePub of the blog entries. Then to read the ePub on my iPad I just uploaded it to my Box.com account and opened it on my iPad. If you have your students blogging on a fairly regular basis they may not even notice how much good content they have written over the course of a semester or a year. Turning their blogs into ebooks could be a good way to show them how much they have done. In a high school journalism class you could have students write their articles on a blog then use Ebook Glue to make the content available for distribution in ebook format too.